The NP-F330-550 is a 7.2 volt 2500mAh Li-ION battery for Sony cameras & Camcorders. Replaces original battery # NPF330, NP-F330, NP-F550, NPF550, etc. 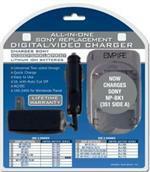 This battery can go inside the appropriate camera models, or can clip onto the outside of matching Camcorders. Please see our extensive X-ref listing to confirm the proper Camera-Battery match. This battery fits over 300 different SONY digital models. Replaces NP500, NP510, NP520, NP530, NP720, NP730, NP930, NP-F330, NP-F500, NPF-500H, NP-F530, NP-F550, NP-F550J, NP-F570, NP-F750, NP-F750SP, NP-F770, NP-F930, NP-F950, NPF960; DR5; Hitacho VNMP720; Kyocera BPF550, BPF750; Nikon NP500, Ricoh NP500; Yashica BPV1.